The Orlando Consort combines forces with the Estonian Philharmonic Chamber Choir under Paul Hillier. It is an interleaved programme of ancient and modern which contrasts the music of Guillaume de Machaut and Guillaume Dufay with modern composers like Tarik O'Regan and Gavin Bryars. Machaut’s extraordinary Messe de Nostre Dame was not only the first complete mass setting in history, but also the first whose composer can be identified, making it emblematic of the Ars Nova style of the 14th century. In this recording, the Orlando Consort performs the mass in parallel with a work by Tarik O’Regan (born in 1978) which was inspired by it. Scattered Rhymes links two texts from the same period as Machaut’s mass, one by Petrarch, the other an anonymous English poem. Both of them subtly combine earthly and divine love, while the music blends polyphonic tradition and contemporary inspiration. "..we couldn't ask for better interpreters: the Orlando Consort and Estonian Philharmonic Chamber Choir have long experience in performing the most challenging music, from the most obscure early manuscripts to recently commissioned works." 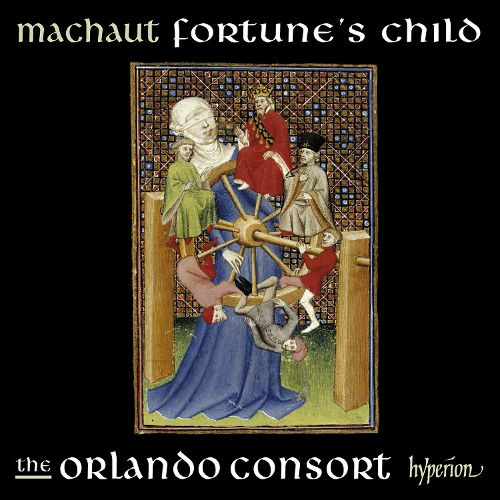 of the Machaut Mass: "[the] Orlando Consort bring vibrant energy and ear-pleasing resonance to this ancient, unusual masterpiece"
"The Orlando Consort (countertenor, tenor and baritone) sounds even in the numerous extremely difficult passages almost heavenly..."
This fascinating disc spans the centuries by coupling medieval masterworks with modern works inspired by them. The four male voices of the Orlando Consort bring vigour and tonal variety to Machaut's Messe de Notre Dame, and its tenor Mark Dobell gives a lilting account of the composer's song Douce dame jolie." The Consort's perceptive accounts of Du Fay's Ave Regina celorum and Gavin Bryars's Super flumina complete the picture." Even if it wasn't now possible to kit yourself out with a genuine SACD player and some surprisingly effective multichannel headphones for around £150, it would be worth investing in the format just to collect the Harmonia Mundi SACDs produced by Robina Young, one of the format's most committed advocates. This is a typically unfaultable example.."
"Mind-expanding music and performances; a stunning recording." "This is a thoughtfully chosen collection of ancient and modern works, each of which seems to tell us something compelling about the others. The a cappella performances by the Orlando Consort are nearly immaculate, and the recorded sound is reverberant and sumptuous." "The performance of the Machaut, by the Orlando Consort, with bass Robert Macdonald, is exceptionally tonally pure and intimate"
"The performances throughout are absolutely stellar, astonishing in their rhythmic precision, unwavering intonation and interpretive bravura." "The singing here has the purity of fine hair, exactly what we would expect from the Orlando Consort." 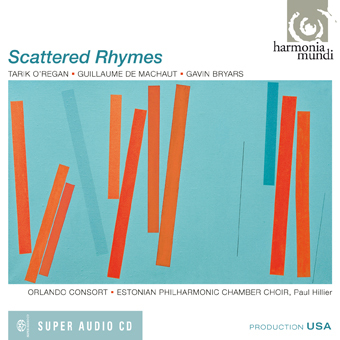 "Stunning, perceptive singing makes this a 'must have' disc."